WORCESTER — Say you’re a German merchant around 1500, looking for a little sport. 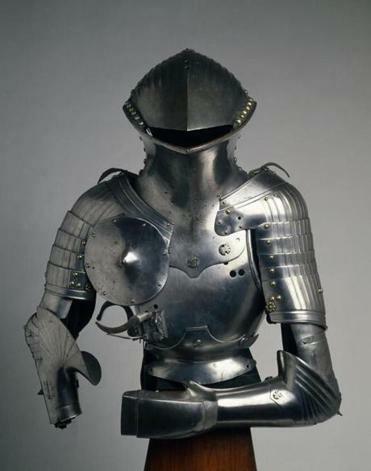 Why not head to your local armory and rent a suit of armor? That’s what they did in Nuremberg. Men less well off than knights and better off than peasants could slap their silver down for the proper outfit and head off to the civic jousting tournament. The armor is a jolly centerpiece to the reinstallation of the Worcester Art Museum’s medieval galleries. Among other things, the new installation integrates the John Woodman Higgins Armory Collection of arms and armor with other objects from the period between 500 and 1500, give or take a few decades. The museum acquired the Higgins collection in 2013, when the Higgins Armory Museum shuttered, and first highlighted it in the popular “Knights!” exhibition, which closed in November. Rather, it’s plain, protective, and not especially flexible, with the helmet bolted to the breastplate so you can’t turn your head. The lance you carry has three prongs at the tip, so it can’t get into the eyehole of your opponent’s helmet. Brackets hold the 11-pound lance in place, so you can’t do too much damage with it, because, let’s face it, you haven’t been properly trained. Still, you’re all set for the melee. If it’s anything like the pile-on depicted in Lucas Cranach the Elder’s woodcut “The Third Tournament With Lances,” a flagon or two of mead might be called for before the joust. And after. The suit of armor is a crafty linchpin for the installation, which curator of arms and armor and medieval art Jeffrey Forgeng, and curator of education Marcia Lagerwey have tailored to help 21st-century viewers relate to the people of the Middle Ages, using hands-on stations with modern reproductions and easygoing wall texts and interactive features that invite personal comparison. Like us, medieval folks felt love and loss — the heartbreaking “Relief From the Tomb of Lady Francesca de Lasta,” commissioned by the lady’s bereaved husband, counts the span of her life down to the minutes. Like us, they grappled with chaotic and changing social orders, and with globalization. A gorgeous Spanish paneled ceiling from the 1400s illustrates the last. For centuries, Spain had been under Muslim rule, and now the Christians were taking over. The ceiling has the rhythm and grace of Islamic design, painted with leafy patterning and heraldic symbols rather than with a more Christian focus on figures and storytelling. The curators only note the Crusades in passing, choosing to emphasize trade between Islamic and Christian kingdoms rather than the bloody warfare that went on for nearly two centuries in the very middle of the Middle Ages. While that could be the subject of its own exhibition, the conflict between Christians and Muslims a millennium ago would, sadly, have relevance today. The focus on everyday life includes topics such as grieving, and how people found meaning and order through religious devotion. Two small panels of a French devotional object, its ivory carved with staggering dexterity, depict the Magi’s adoration of Christ and the crucifixion. Their owners, who perhaps could not read, could return to them like passages from the Bible. Lagerwey told me in an interview that the organizers avoided using the term “dark ages” because it’s a negative stereotype of a time that spawned magnificent cathedrals and universities. But before now, the dim galleries evoked dark ages. 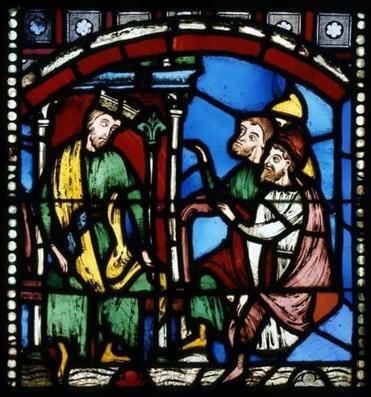 Windows had been masked since the 1970s to highlight stained-glass works. A selection of stained glass remains, but natural light pours in around it. The space used to forbid; now it beckons. This contrast blares in two sculptures of the Virgin and child. A Spanish wooden madonna from the 1100s sets the jarringly adult-looking baby Jesus on his rigid mother’s lap. The piece communicates solidity, order, and the church’s power. A more personalized, expressive Mary, holding a baby who plays with her veil, appears in a mid-1300s French version. The chaos of the Roman Empire’s dissolution was waning, Christians felt safer and now asked for more from their religion than structure; they wanted emotional connection. Although George was a Roman, his legend with the dragon dates to the Crusades. George was said to have been passing through Libya and was called upon to slay a dragon; he agreed to do it if the locals converted to Christianity, which, the story goes, they did by the thousands. Here, he stands in armor filigreed with swooping Gothic patterns you’d recognize from cathedrals. He leans on his sword the way Charlie Chaplin leaned on his cane. His foot turns out as if to show off his finery, and rests on a dragon the size of a miniature poodle. No ordinary merchant in rented armor, he. Who knew St. George was a dandy?